Should Your Shop Install Outside Parts? It’s pretty common for a customer to ask their local shop to install a part they bought online (aka an ‘outside part’). Performance and off-road shops have been dealing with this awkward situation since Al Gore invented the Internet. The question: Should off-road and performance shops install outside parts? Let’s weigh the pros and cons. Perhaps as much as 20% of all online parts consumers are “DIFM” customers, which means they will look for a shop to “do it for me” on the install. While 20% might not sound like much, it works out to tens of thousands of people across the US and Canada. Many shops refuse to install parts that they don’t sell the customer (more about ‘why’ below), so there may be high demand for installation help. Additionally, a lot of consumers appreciate the transparency of this process – they get to pick out their parts and find the best deal, then work with a professional to get the parts installed. If things go well, these consumers can be a good source of repeat business. If you let your customers bring in parts they bought elsewhere, your shop doesn’t get to sell parts. This means your shop will miss out on the 20-40% margin that can be earned from selling the parts directly to the consumer. If this doesn’t sound like a big negative, consider: parts are extremely profitable, as there’s very little cost involved in handling them. As long as your shop has a good process for ordering the right parts – and making sure customers pay their bills – selling parts is easy money. It’s easy for an inexperienced person to accidentally order the wrong part or an incomplete set from an online retailer that doesn’t offer a user-friendly parts catalog. Heck, it’s easy for an experienced tech to order the wrong part! But when the consumer orders the wrong part online, they often have a very narrow return window. If your shop is busy, or the customer is a bit slow in getting their parts to you, it’s easy for the return window to close. If the customer ordered the wrong part and can no longer return it, they’re going to be upset. Consumers buy these parts because they don’t know better, or because they’re trying to save money. Still, it’s often the installer who gets the blame if/when a part fails prematurely. As tempting as it may be for a performance or off-road shop to help consumers install parts they bought elsewhere, there are clearly more cons than pros. Therefore, the best policy for most shops is to refuse to install parts that were not ordered directly from your shop. Explain that your shop can’t return or warranty parts that it hasn’t sold. Explain that your shop’s work can only be guaranteed if your shop has a parts warranty (see #1). Explain that your shop recommends specific parts for specific purposes – part of the value you provide to the customer is knowing which parts work best. Additionally, some shops offer a part price match guarantee. This means that the shop will gladly match the best advertised price the consumer can find online for whatever part the consumer can find, excluding used parts, counterfeit parts, discontinued parts, or one-time special offers. 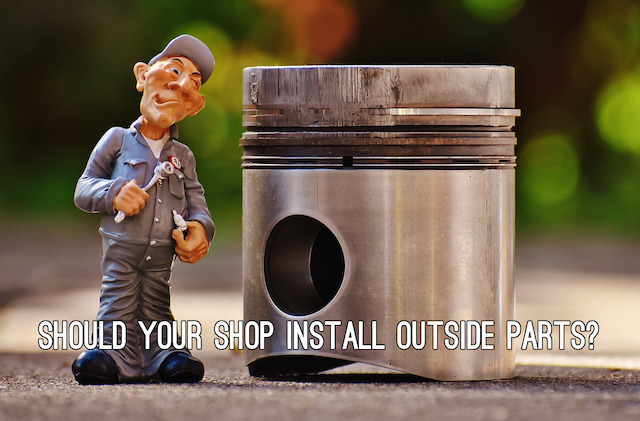 Finally, even if your shop has a “no outside parts” policy, exceptions can be made. If the customer has ordered thousands of dollars worth of upgrades from your shop, and wants you to install a set of shocks they bought online as part of this project (for example), so be it. Whether your shop decides to offer installation services on outside parts, or your shop is merely making an exception to a ‘no outside parts’ policy, there are a few things that can be done to limit your shop’s liability. Make sure to give the customer whatever paperwork came with their outside parts, especially any warranty documentation. Installing outside parts is often a bad business practice for off-road and performance shops. It reduces shop profitability, limits a shop’s ability to guarantee its work, and sometimes forces a shop to install a part they would never normally work with. Instead of installing parts that consumers buy elsewhere, performance and off-road shops should offer consumers a website of their own. Using RPMWare, for example, it’s relatively straightforward for a shop to get their own parts website up and running. This allows a consumer to have some input on their project, without involving a 3rd party retailer.